The clinical and evidence-based use of music interventions to accomplish individualized goals within a therapeutic relationship by a credentialed professional who has completed an approved music therapy program. 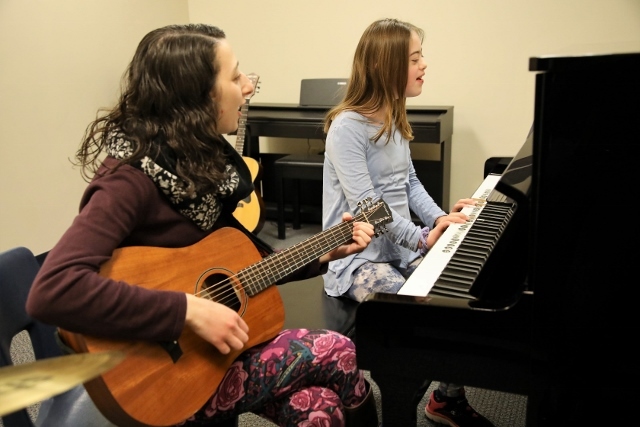 The Music Academy provides individual and group music therapy to persons of all abilities and backgrounds focused on developing clinical goals through personalized music experiences with our board-certified music therapists. Our approach is founded on actively engaging clients in music by expanding upon their natural interests. Music therapy can address a wide variety of clinical domains. Our staff strives to identify, develop, and adapt treatment plans based on the individual strengths and needs of each client based on the current research literature. Each goal area is treated through how the client engages, adapts, and initiates novel music experiences.